Google's web browser gained a couple new features this week in a couple different updates. First up is the latest update to Chrome for Android. This was a relatively minor update, but it adds a feature which most Android users will appreciate. 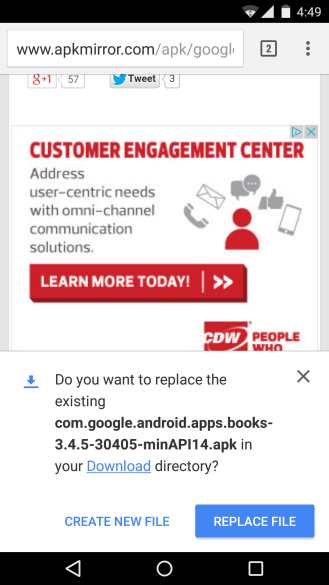 Try to download a duplicate file and Chrome for Android now prompts you to replace the existing file rather than download a copy. This is a feature which Chrome for Windows lacks, and it's going to save space on our mobile devices. That's why I'm thrilled to see it. And since we can still download those extra copies there is no downside. You can find the Chrome app in Google Play. In related news, Google also released an extension yesterday which adds new color adjustment options. 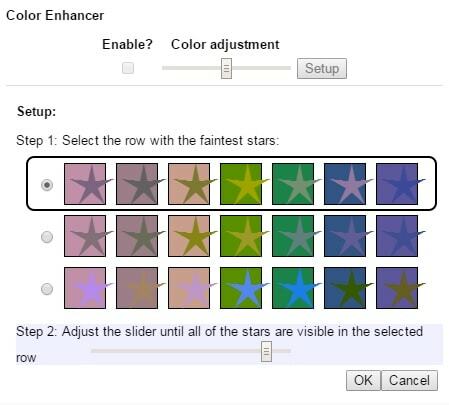 Color Enhancer is a user-adjustable color filter tool which tweaks the colors of the images and fonts in webpages in order to improve color perception. I know that doesn't sound like much (not if you don't have color-blindness issues) but I've spent a few minutes adjusting the colors on my laptop and I can say that calling it a color enhancer is an overly-simple-sounding name for an extension which is incredibly useful. There's no documentation on which color blindness issues can be helped by this extension, but after setting it up I found it even helped me - and I have never really had any issues. Installing the extension adds an icon to the menu bar, and when you click it you will see a menu which prompts you to select the row of stars which are difficult to discern. You can then adjust a slider bar to make the stars easier to see. This, for example, is my ideal setting. That might not work for you, but it sure as heck helps me. And that's why I'm leaving this extension installed enabled even though it is also altering the color for links from reddish to a light purple and doing some strange things to icons. B: On second thought, I'm not sure I want to leave it enabled. This helps me see images but I don't need its help with text. That is easily visible against a white or off-white background, so no enhancement is necessary. I think this extension could use more work, and perhaps additional options for subtly tweaking the color options. You can find Color Enhancer in the Chrome Web Store. P.S. While we're on the topic, what do those colors look like to you? Did my adjustment improve the visibility or make it worse? Color blind person here (very strong deuteranomaly, meaning I barely see green)… When I’m trying to calibrate Color Enhancer, I can’t really see the two stars on the right in the middle row (they are perfectly visible in the image above, but the three on the lower left of the bottom row are invisible). I move the slider to the right and those stars come vaguely into view, but the star in the middle disappears entirely. My experience is that color blindness fixes tend to work like this — they improve some things by making other things worse. Or at least for me.